The Charlotte area's offerings of barbecue continue to grow. I was invited last week to visit Moe’s Original Bar B Que, which opened in June in Matthews. 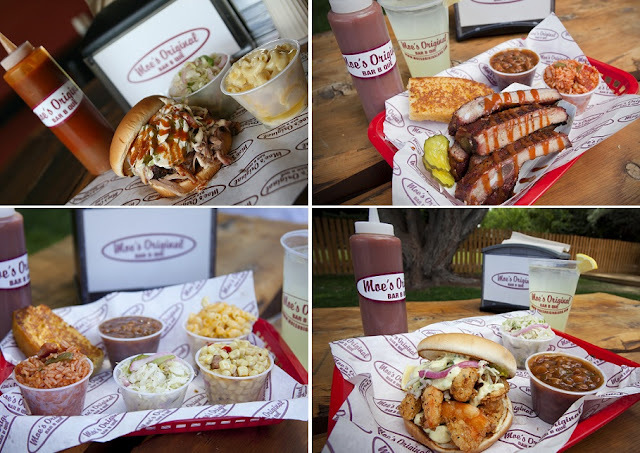 The barbecue franchise started as a single restaurant in Colorado by three friends who met at the University of Alabama. That pretty much explains why today nearly all of the 26 locations are either located in Colorado or the South--Alabama, Georgia, North Carolina, and Tennessee (relatively speaking, the franchise has expanded rapidly over the last three years). The Matthews location is owned by another trio, husband and wife Brian and Janeen Fairhurst, and brother Craig Fairhurst. They picked a great location in the charming area along Matthews Station Street, which has the look and feel of a quaint town square. There are restaurants, shops, the Village Green park, public library, historic train depot, and more all in that area. Moe's is housed in a standalone space that formerly housed a Mexican restaurant, but you know you're in a BBQ spot as soon as you enter. Whenever visiting a barbecue restaurant for the first time, it's imperative that I try the pulled pork. So I ordered the Pulled Pork Platter ($10.25), which comes with two sides, cornbread, and a drink. I chose the mac 'n cheese and banana pudding as my sides. The pork was juicy and tender, and the sauce was flavorful, with a great mixture of spiciness and sweetness. The mac 'n cheese was tasty as well. And I'm a stickler about my banana pudding so I was prepared to be extremely critical: Moe's passed the test. It was good, even though, strangely to me, the pudding was more of a cream color than yellow. Didn't matter though--it was delicious. Moe's is a family-friendly restaurant, but also has a small bar that serves about a dozen local and regional beers on tap (a good selection). When I arrived on that Thursday evening around 6:45 p.m., the restaurant was packed with people of all ages. 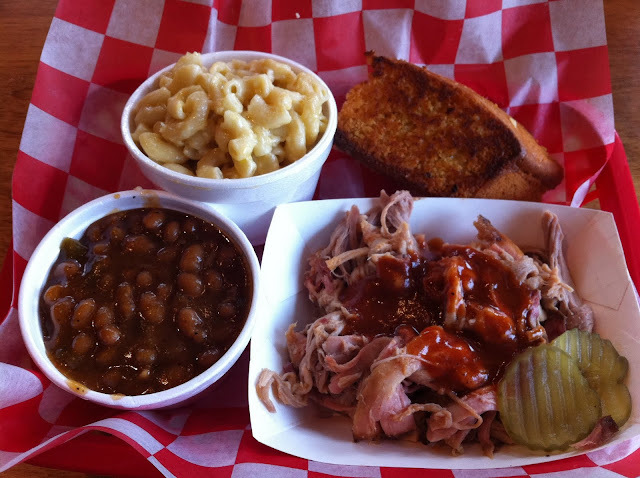 I get asked often by people who are visiting Charlotte, are new to Charlotte, or by my blog's readers who email me asking, what are the best places in Charlotte to get barbecue. I'll now add Moe’s Original Bar B Que to my list of suggestions (which includes Mac's Speed Shop and Queen City Q, as well as others outside of the center city), and by visiting Moe's it'll also give them an opportunity to experience this quaint downtown area. Moe’s Original Bar B Que, 111 Matthews Station St., Matthews, 704-814-6637, moesoriginalbbq.com, facebook.com/MoesOriginalBBQMatthews, twitter.com/MoesBBQMatthews. Hours: Mon-Sat., 11 a.m.-9 p.m.; closed Sundays. They have really good turkey bbq too! We love it! Right in the heart of Matthews and great food. We've enjoyed a meal with the family and gone back to taste their great craft beer selection. I believe that it is the best bbq in Charlotte! You need to try it! Ordered the pulled pork sandwich. Thought the size was quite small for the price. Mac and cheese clearly made horriblly with not enough cheese in it. Hushpuppies were amost burned with a soft light batter but so sweet I realized that being a diabetic I would be able to eat them. Too hight price for such small servings.